Forget the muted décor or pastel shades, this year is all about going big and bold with your colour scheme. Brides are turning their backs on too much clinical white and embracing the colour wheel with joyous abandon. 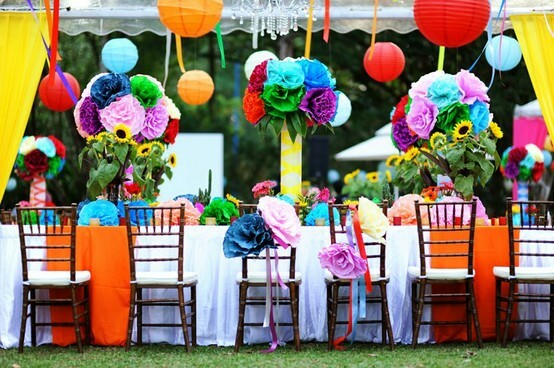 Many interesting colour schemes can look amazing, especially in the wedding photographs, so if you want to stay on trend this wedding season, go bright. Get beautiful photographs at your Bournemouth wedding with Bournemouth Wedding Photographer, Nick Rutter. Large, elaborate flower displays, walls and candelabras are out this year, replaced with a much subtler style. Small, low flower arrangements for aisles and tables are in vogue this year, as are wild flower choices and more natural, bohemian arrangements as inspired by last year’s royal wedding. Couples are searching for unique experiences for their guests to enjoy, and as the photo booth and sweet cart have been somewhat overdone, it’s time to look for something new. Think singing waiting staff, magicians, tarot card readers and themed character coat staff for example. While we’d all love an ice sculpture, they can be a bit of a performance to set up. An easier and more on trend addition to drinks are floral ice cubes. These will make a unique and special way to jazz up your guests’ drinks. Food trucks are not new, so if you’re still looking for a casual way to serve great food to your guests, consider fun sharing platters or ethical farm-to-fork ideas. Perhaps following the royal tradition, brides are adding sleeves to their gowns this year. Gone are the strapless, elaborate affairs. They are being replaced with simple materials, classic cuts and sleeves. Guest consideration is growing in popularity, taking the focus off the couple a little and investing in the guests. The recent trend is to go the extra mile and giving guests wellbeing and luxury favours, personalised gifts or even hand-delivered favours. Other ideas include hangover care packs, food packs and recycling wedding flowers into small bouquets to be delivered with thank you notes. Keep reading mother of the bride hairstyles. Today’s couples are far more inclined to think of the environment when planning their wedding. As a result, current trends include going plastic-free and using things like linen napkins and paper or glass drinking straws for example.